We’re always talking about how our Concentrated Herbal Granules are free from cornstarch, but what exactly is the significance of this? Whilst cornstarch is widely used in food products and to thicken sauces in cooking, cornstarch is also widely used in concentrated herbal granules which are produced using the method Fluid Bed Granulation (FBG). FBG essentially involves spraying the herbal liquid onto cornstarch particles to make granules, so you can imagine that the cornstarch content is quite high. It’s an inexpensive and natural food additive also used to prevent clumping of the granules by soaking up excess moisture. Of course, this is important, as many of us know how frustrating it is when your granules have clumped together. However, there are two main problems with using cornstarch. Coeliac disease and non-coeliac gluten sensitivity are becoming an increasingly pressing issue, especially with the better awareness of symptoms between health professionals and the public. Unless your supplier can prove to you that they have used certified gluten-free cornstarch as an additive, you run the risk of gluten contamination. Whilst corn or maize is gluten-free, cornstarch is often produced in the same facility as other grain products, and so cross contamination is very likely. Phoenix Concentrated Granules are gluten-free, with the exception of wheat products – Fu Xiao Mai, Shen Qu, Mai Ya and herbs which have been processed with wheat bran. At Phoenix, we do not use cornstarch in our concentrated granules. We use a food safe binder called Maltodextrin, which is a long-chain polysaccharide and certified gluten-free. We only use a minimal amount of this binder at just 5-10% to stabilise our products. 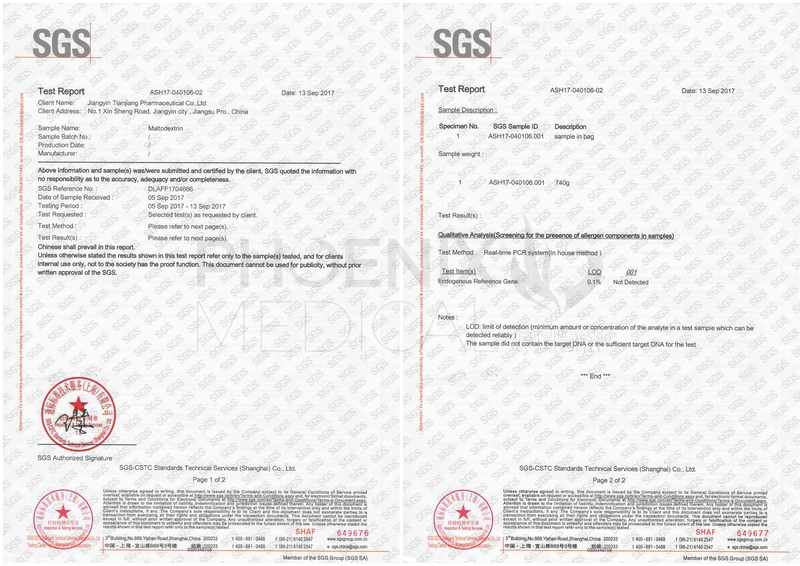 Our manufacturer Tianjiang Pharmaceutical, part of Sinopharm, has tested maltodextrin and has not detected any traces of gluten. See test results here. As mentioned earlier, FBG involves spraying herbal decoction onto cornstarch particles to make granules. Compared to the Phoenix Concentrated Herbal Granules, which are produced by Spray Dry Granulation SDG, FBG granules can be 2-3 times lower in concentration as they are heavily diluted with cornstarch, and thus the efficacy will be much lower. The price of FBG granules may well be cheaper but you really do get what you pay for. By using Phoenix Concentrated Herbal Granules, you will find that you can use less product, whilst achieving better efficacy rates. Add a teaspoon of granules to a mug, then add a little water. Put into the microwave and cook for 10 seconds. If the mixture has become lumpy and thick like porridge, then cornstarch is present. Chinese herbal medicine can be unpleasant to drink, but to also drink it with cornstarch is even worse. Luckily, you will not find this with Phoenix Concentrated Herbal Granules as they are water soluble and the mixture will remain a watery tea when mixed with hot water. commentLeave a Comment on Cornstarch in Concentrated Granules: What Are the Dangers?